I have spent the best six months of my life at Silverstone, which is a long time to be marooned on a former RAF bomber base sprawling over a windy plateau in Northamptonshire or Buckinghamshire, depending on my choice of corner, the circuit being located on the county boundary. I have seen the circuit covered in snow (Daily Express International Trophy 1973), I have cowered from the mother of all thunderstorms (British Grand Prix 1975), watched Keke Rosberg win his first F1 race in a monsoon (International Trophy 1978) and been attacked by a million insects during the hot and humid 1983 Grand Prix. Alain Prost won by nearly 20 seconds and the bugs were the most exciting thing that happened all day. It was the last British GP to take place on a Saturday and that fact alone makes it seem a very long time ago. Latterly I have indulged my love for old racing cars at the Silverstone Classic where even three solid days isn’t enough to see all I want. In this 40-year relationship I have seen some extraordinary feats at the self-proclaimed Home of British Motor Racing and, whilst Mansell’s shouldering past Piquet into Stowe in 1987 was viscerally exciting, I don’t think anything came close to the majesty of Keke Rosberg’s pole position lap in 1985. The story goes that he dragged hard on his Marlboro, ground it out in pit lane, said “Let’s do it” and hustled his 1000 bhp Williams Honda on a lap where he averaged 160.9 mph. On a less than totally dry track. With a slow puncture. 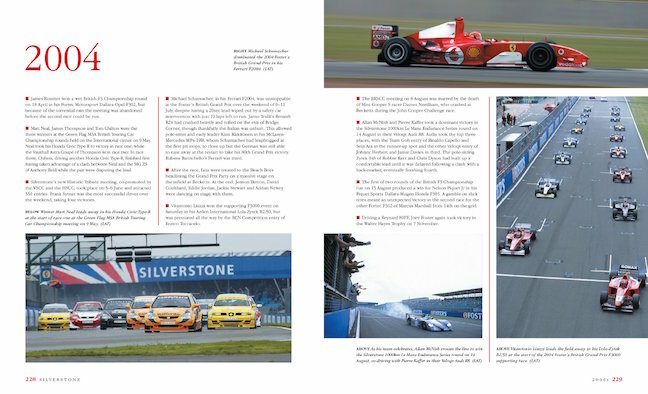 These memories and many others came back to me as I read Silverstone which is an attempt to tell the definitive story of this most famous of tracks. It’s a good attempt too, but the book does have some shortcomings. Appearance is one of them; although in large format, beautifully printed on proper paper and well illustrated with many unfamiliar photographs it somehow has the look of a coffee table book of the sort you’d pick up for a fiver in one of those bookshops for people who don’t read books. 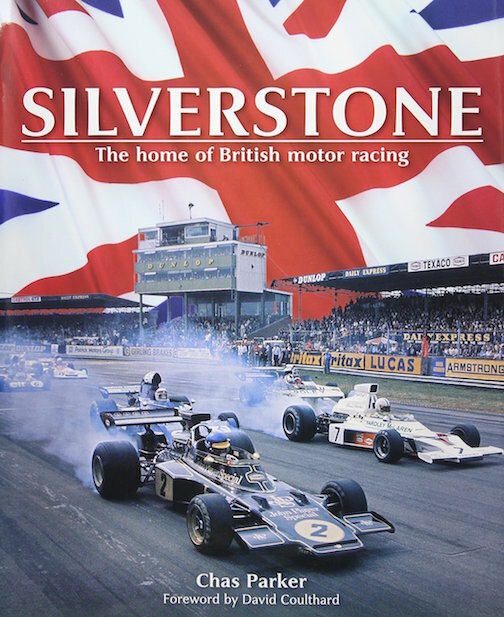 But as it costs a fairly hefty $35 in the US (and an eye-watering £40 in the UK) I need to say that unless you have a real interest in Silverstone, enough to want to read a detailed history of the negotiations and dealings that have characterized the track’s 60-year history, then your money may be better invested elsewhere. 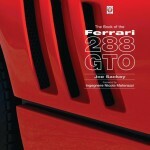 But if you have spent as much time as I have at Silverstone it is well worth putting this book on your birthday present list and at least that suggestion might have a better chance of being fulfilled than the F458 you said you wanted last year . . . 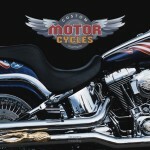 The 288-page book is structured around separate chapters for each decade, from the 1950s until the present day. 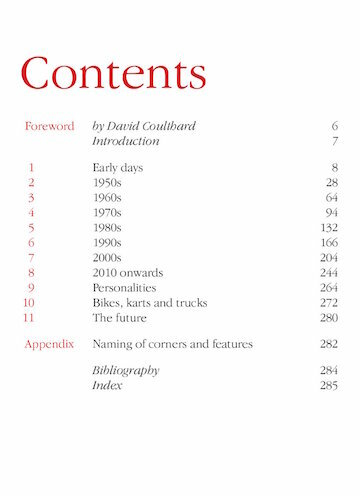 They are bookended by an Early Days section describing the circuit’s genesis in 1947/8 and by short chapters on personalities, bike, kart and truck racing and a chapter portentously entitled “The Future.” Each main chapter tells the detailed story of Silverstone’s evolution, supplemented by bullet points and photographs covering that decade’s racing. But the main theme of the work is the constant development of a track that has gone through a bewildering variety of layouts, especially since the 1980s when the circuit started to include more medium and low speed corners. 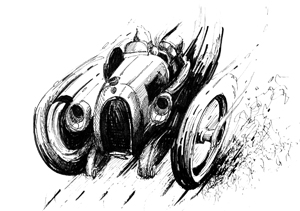 We may have lost the near flat-out Club Corner but we have gained the extraordinary Becketts’ sequence which shows a Formula One car at its G-loaded best. We gained Bridge for a time as well, and what a fabulous place to watch a Grand Prix driver at work that corner was, but sadly we lost it in the last round of changes. 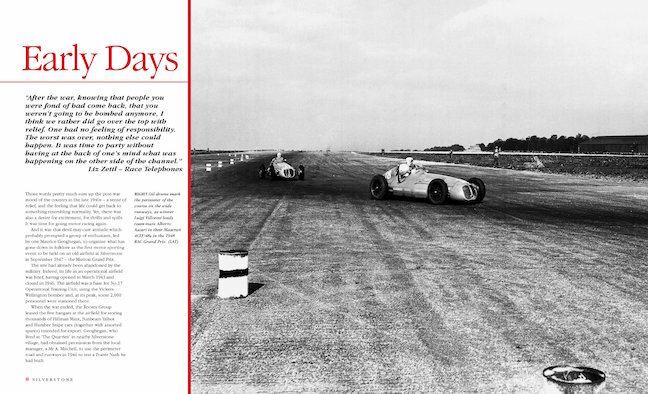 “The past is a foreign country,” wrote LP Hartley and the truth of that phrase strikes home when you read that the original Silverstone pits were separated from the circuit by nothing more substantial than a painted white line. In 1963 the legendary racer Christabel Carlisle spun her Austin Healey Sprite into the pit lane and a scrutineer was killed in the accident. She never raced again. Fast-forward to 1973 and the Grand Prix is featured at length, primarily because of the enormous crash Jody Scheckter caused in his McLaren M23 at Woodcote, resulting in half the grid being taken out of the race. But the ’73 race is famous also for something else, which is Ronnie Peterson’s display in his Lotus 72. Legend has it— and so does the book—that Ronnie was on full opposite lock going through Woodcote. I was at that spot during final practice (only Americans did “qualifying” in 1973) and, whilst the sight of the black and gold Lotus was mesmerizing, he was certainly not on full opposite lock. It was not a Colin McRae-style broadside but a constant blur of twitches and adjustments as the Lotus teetered for grip at 150 mph. But even this reality still had the capacity to amaze. The author deserves credit for his professional and diligent work in describing the Byzantine complexity and Machiavellian negotiations that have surrounded Silverstone’s efforts to retain the right to stage the Grand Prix. Much of Bernie Ecclestone’s antipathy towards the track’s management can be attributed to the jeering and heckling that some BRDC members indulged in after Ecclestone had spoken to them. The F1 boss reportedly said, in 2002, that Silverstone was “a country fair masquerading as a world championship event” after having had to be driven into the circuit by car because the weather was so poor that his helicopter could not land. And (poor lamb) he had to join a queue, just like the “civilians” such as you and I who pay his wages. Parker also pulls no punches when he describes the huge rift in the membership resulting from the late Tom Walkinshaw’s proposal—as a BRDC board member—that the BRDC should invest over £5m in Walkinshaw’s garage business. Yes, you did read that correctly. The apparent conflict of interest caused ructions, which only intensified when the BRDC realized that the legal advice it had been given about some aspects of the proposal was wrong. 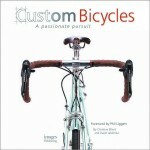 If, like me, you and Silverstone have been an item since way back when, I recommend this book wholeheartedly. If subject matter and author sound vaguely familiar, know that Parker a few years before this one had penned Endurance Racing at Silverstone in the 1970s & 1980s, one of those small booklets in Veloce Publishing’s “Those Were the Days” series (ISBN 9781845842772).